Like the vast majority of the British beauty blogging community, I’m besotted with bronzed and typically neutral eyeshadows; I find myself wearing neutral eye makeup on a day to day basis and I even get nice compliments on it sometimes. So, with confidence and passion in the bag, I thought it was about time to put together an edit of what I consider to be the staples in my bronzed eye wardrobe. Let’s start with easy and get progressively harder. Firstly, I find the Maybelline Colour Tattoo in On and On Bronze to be the best way to create a workday bronze eye without any fuss whatsoever. Similar to the MAC Paint Pots, these drugstore dupes are cream eyeshadows that come in small glass pots. The easiest way to apply it? Get some shadow onto your ring fingers and simply smear it over the lid. Blend out the harsh edges with a fluffy brush and you’re good to go! Alternatively, use the colour as a base to some powder shadows to create a darker look. I’ve done a full review on the Colour Tattoos here. My next pick (and possibly my favourite from this list) has sadly been discontinued once again. Nonetheless, I’m talking about the NARS And God Created The Woman Palette which should be coming back in stock later in the year. I received this as part of a Space NK gift package from my auntie at Christmas and I’ve been head over heels in love with it ever since. With three shimmers and three mattes, the palette is perfect for creating any kind of eye look. I like to take the colour in the top left all over the lid and the colour in the top right into the crease to create a shimmery neutral look. Though the palette has been discontinued, similar colours are available in the NARS Kalahari Eyeshadow Duo. My final favourite for a neutral eye look is everyone’s favourite. 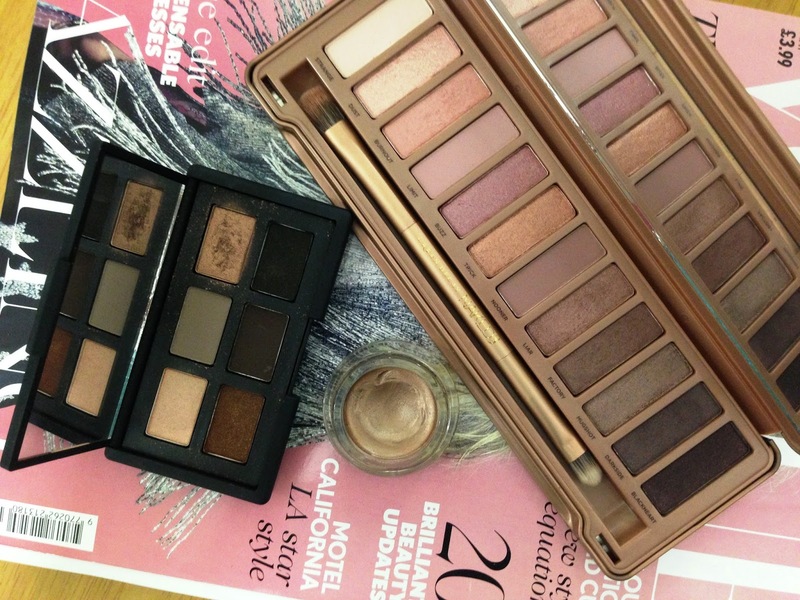 The Urban Decay Naked 3 palette hit us as soon as we heard the rumours about it and we’ve all been addicted ever since. I waited for a while and finally picked mine up a few months back and I find myself using this for so many different things. I’ll either take colours like Liar or Buzz all over the lid and leave it, or I’ll take colours like Dust or Burnout across the lid and blend a colour like Factory or Mugshot into the crease. Definitely an easy look for those who are willing to get daring with their eye makeup but if you can pull it off, it looks wonderful.